As a manager, you can design a status report for team members to complete that contains the information you want to receive. 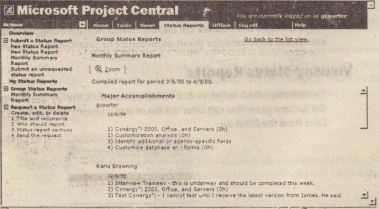 You can then several team members in one consolidated status report. If you want to add a new resource to the resource list; click the button at the bottom. Choose the type of authentication: Windows or Project Central, and enter the requested domain and username information. Click Next to move on. 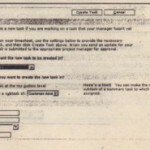 team member can also create a status report form by choosing Submit an Un requested Status Report from the Acnonspane. They can enter a report name, name who it is going to, denote the period it covers, and then add whatever sections they want to Include. When they are ready to send it, they.can click the Send button, or save It and send it later. When team members receive status reports to complete, they are presented with a form, .such as the one shown in Figure 16.14, that contains the sections you included when you set up the report. 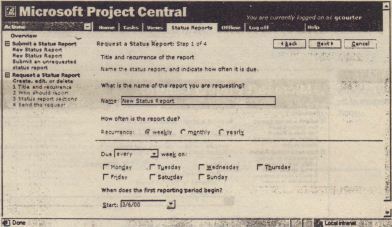 You can also group the reports by Status Report Name, Start Date, and Submitted Reports by choosing a Group By option. 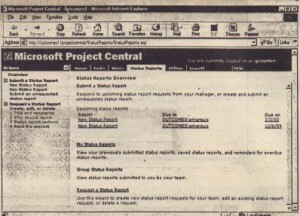 To open a report, click the report in the Report column, or select the report and click Open. Or you may choose to update, forward, or delete the report . 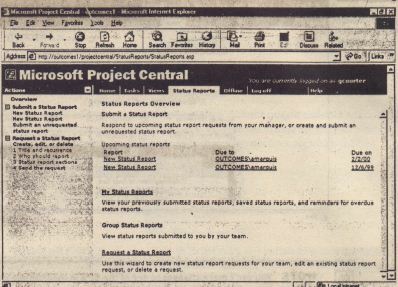 To view a group status report, click the Group Status Reports link in the Actions pane to open the Status Reports Overview, or choose to open a specific group report from the Actions pane. If you opened the Status Reports Overview, you can choose to see a group status report by selecting the report from the list of Group Status Reports. You can then choose whether you ~ant to open an individual team member’s report or the team report. A paper icon in the date column mdictes a report that is available to view. 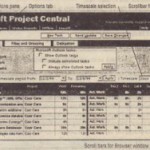 Send To »Page by Email from the Internet Explorer window, This opens an email form that you can use to send the page, S To save the page as HTML, choose File > Save As, and enter a file location and file name in the Save Web page dialog box that opens. Whether you use the email workgroup tools discussed in Chapter 15 or Microsoft Project Central, you can work inside Project Itself to assign tasks, send updates, and solicit. status reports. You can use TeamAssign, TeamUpdate, and TeamStatus on the Workgroup toolbar or from the Tools > Workgroup menu to communicate with team members.